AroundCampus kicks off its nationally recognized summer internship program with its Sales Foundations Academy. No other company invests in the professional development of college students the way we do. 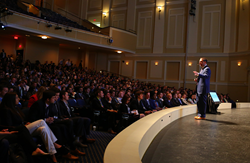 Last week 750 college students representing over 250 campuses across the United States converged on Chapel Hill, NC to participate in AroundCampus Group’s (AC) 43rd annual Sales Foundations Academy (SFA). Held on the campus of the University of North Carolina at Chapel Hill, the SFA is a week-long, expenses paid, intensive training event that launches AC’s nationally recognized summer sales and marketing internship program. The 2016 SFA participants received comprehensive classroom instruction on topics ranging from client prospecting to account management and professional communication. Now back in their respective college markets, interns will help connect local businesses with the campus community by sharing print and digital advertising solutions in AC’s expansive suite of marketing platforms, including student planners, deal books, AC website and mobile app, the UConnection food and entertainment app, and CollegiateParent print and digital guides. In addition to delivering invaluable sales and marketing training, the SFA hosts a Career Fair, where interns can connect with AC’s Career Partner Network, a group of top employers seeking to fill highly coveted, full-time sales positions. At the end of each summer, AC provides its Career Partners with critical statistics on the summer internship’s high performers, helping to match exceptional employers with exceptional candidates. This year, AC received over 12,000 applications for the summer internship program. Regional Managers interviewed more than 4,000 college students throughout the US. “We choose 750 interns out of thousands of applicants,” O’Brien noted. “We bring the best and the brightest college students here. Contrary to what you’ve probably heard about this generation, they are smart, eager, hard working, and ready to share our marketing platform with businesses across the United States. These students are consumers—in a big way, they know what it takes for businesses to reach them. Our platform brings great value through our omni-channel offering." Each fall, internship alumni become the newest members of AC’s Brand Ambassador network, the largest of its kind in the United States. Ambassadors provide vital feet-on-the-ground and social media representation for some of the country’s top companies and their brands on more than 250 campuses in 42 states nationwide. With a summer’s worth of immersive sales and marketing experience under their belt, AC Brand Ambassadors are highly trained and able to communicate relevant brand messaging, putting them head and shoulders above the competition. AroundCampus Group is the nation’s most established collegiate marketing and media firm, with 42 years of experience in the college market. The company's ever-advancing goal is to produce relevant media and facilitate meaningful moments for college students, parents, and faculty to encounter, experience, and engage with exceptional brands. AroundCampus is built to perform multi-directional campaigns, meeting its target audiences where they are, when they’re listening, and communicating with them in their language. Their diverse media platform comprises over 400 student and parent publications, a national network of more than 800 brand ambassadors, digital signs on over 250 campuses, and an expert digital marketing team that manages their numerous mobile applications, websites, and social interactions.